The Dreamliner, the fastest-selling commercial plane in history, rolled out Sunday. 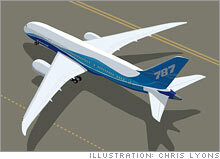 (FSB Magazine) -- The Boeing 787 Dreamliner is aptly named. When it lifts off the runway at PAE Paine Field in Everett, Wash. for its first test flight this summer, it will carry the dreams of more than 900 small subcontractors that helped create it. With 584 copies on order as of June, it's the fastest-selling new plane in the history of commercial aviation and will keep Boeing and its suppliers busy for a decade or longer. For some subcontractors, catching a ride on the 787, which rolled out Sunday, will be their big break. Missing the flight has already put one would-be contractor in peril: Thermion Systems International (See "Iced out of a deal with Boeing? "), which thought it had a deal to supply de-icing equipment, says it was elbowed out of the program and is struggling to survive. The 787, a midrange cruiser, is packed with technological firsts, including the pioneering use of composites in a commercial liner's airframe. Equally remarkable is the way in which Boeing has structured its manufacturing process, bestowing unprecedented opportunities on small suppliers and ushering in a new era for the aerospace industry. Boeing says 70% of the 787 has been outsourced; rival Airbus is relying on subcontractors for about 50% of its A350 plane, now in development. "This farming-out of the airplane's construction is revolutionary," says Richard Aboulafia, vice president at Teal Group, an aerospace consulting firm (tealgroup.com). For decades, Boeing has outsourced a portion of the work on its planes, and its reliance on sub-contractors has risen with each succeeding generation of aircraft. But with the Dreamliner program, the aerospace giant has reached a point where its role has changed. It now functions less as a manufacturer than as a project manager, supervising its first- and second-tier subcontractors, each of which may rely on scores of more specialized subcontractors. Boeing handles final assembly, marrying the cockpit, fuselage, wings, and tail sections, which are completed elsewhere and delivered to its plant. "Boeing's objective is to get these 'supplier partners' to do as much heavy lifting as possible," Aboulafia says. "That gives small businesses more responsibility." Boeing says it can't supply a full list of subcontractors that are working on the project, but industry analysts estimate that their numbers are greater than the 900-plus that contributed to the 777, which began construction in 1990. Boeing spokesperson Loretta Gunter confirms that the processes used to construct the two planes are markedly different. "We have fewer first-tier subcontractors on the 787 than we did on the 777 because each is providing bigger components," she says. "Likewise, many of them are contracting out bigger jobs to their subs." Boeing's new manufacturing template has captured the imagination of the aerospace industry. Recently officials from Airbus told analysts that the company will up its outsourcing to become more competitive. "For any company that wants to be successful in aerospace manufacturing, Boeing's new strategy is the way forward," says Aboulafia. "Which is ultimately good news for small business." It's already good for Kreisler Manufacturing in Elmwood Park, N.J. Kreisler started out as a jewelry manufacturer, but when things got tough in that business, management decided its metal-finishing skills could be transferred to the aerospace industry. To cut costs and get into the European stream of the global outsourcing system, it invested in a new 52-employee machine shop in Krak�w, Poland. "Our presence in Poland made us competitive from a global standpoint," says Brad Barnes, 53, Kreisler's director of sales and marketing. Kreisler became part of the Dream-liner program through Rolls-Royce, which was hired to develop engines for the plane. Rolls contracted with multinational conglomerate Parker-Hannifin to make the fuel and hydraulic-flow systems. Parker-Hannifin hired Western Filter Group, a company based in Valencia, Calif., to supply the filtration equipment for the 787's hydraulic system, and it gave the order for fuel-manifold and associated tubing for the engines to Kreisler. As part of that agreement, Kreisler received certification from Rolls-Royce for various types of welding work. Having demonstrated its expertise on the 787, Kreisler is prepared to take on more projects for Rolls-Royce, which would become the company's first European customer. Not only is Boeing pushing responsibility out to more subs, it is also demanding more from them. Many have created new systems and products, rather than simply filling orders to Boeing specs. Green Hills Software of Santa Barbara, for example, won the assignment to write the operating system for the on-board flight-control computers. That's the kind of critically important work usually reserved for tier-one contractors. Green Hills was hired by tier-one contractor Honeywell, which specified Green Hills as part of its work for Boeing on the flight-control system. "Honeywell doesn't specialize in operating systems," says Dave Chandler, senior vice president of sales for Green Hills. "It's easier for us to handle because that's the only thing we do." American Panel, based in Alpharetta, Ga., is another small company entrusted with critical technology and another small player whose product was identified specifically by a larger contractor when dealing with Boeing. It supplies LCD displays that go into instrumentation systems built by Astronautics Corp. of America. "Being able to create a display that's readable in bright sunlight is a very narrow niche," explains Jim Niemczyk, vice president of business development for American Panel. He's convinced that riding in the 787 is just the start: "Once our screen is on the latest, greatest plane, Boeing is going to want to retrofit it on all of them," he says. Here are some of the suppliers behind the Boeing 787 Dreamliner. LMI AEROSPACE St. Charles, Mo. KREISLER INDUSTRIAL Elmwood Park, N.J.
WESTERN FILTER GROUP Valencia, Calif.
Iced out of a deal with Boeing?